Alkaline Battery Life | Learn About AA, AAA, 9V Battery Life and more. Battery Expiration Dates. Learn about Duracell AA battery life, AAA battery life, 9V battery life and more. Since the life you'll get from a battery is dependent on when the battery was made, not necessarily when it was put into service, it’s important to know the date code so you can be sure the battery you buy is “fresh” and hasn’t been sitting on the shelf for a couple of years. When you buy batteries from Medic Batteries, rest assured you will receive a fresh battery shipment for the longest Duracell AA battery life, including lithium battery life and others. Most batteries Medic Batteries stocks are date coded, which ensures fresh Duracell AA battery life for every purchase. Learn more about battery life. Batteries operate on a chemical reaction. The reaction continues even as the battery sits outside the device. If it is left to sit long enough, it will eventually burn itself out. Manufacture and expiration dates most likely have little to do with each other. It will probably depend on the manufacturer. The expiration date is usually the date past which the manufacturer will not guarantee that full life is left. It is probably a conservative date, so most batteries will have a full life after that time. Better batteries will show a later expiration date. Alkaline battery life is so dependent on how the batteries are used, and there are no standards. Duracell AA battery life is reliable and long-lasting compared to cheap, generic brands. 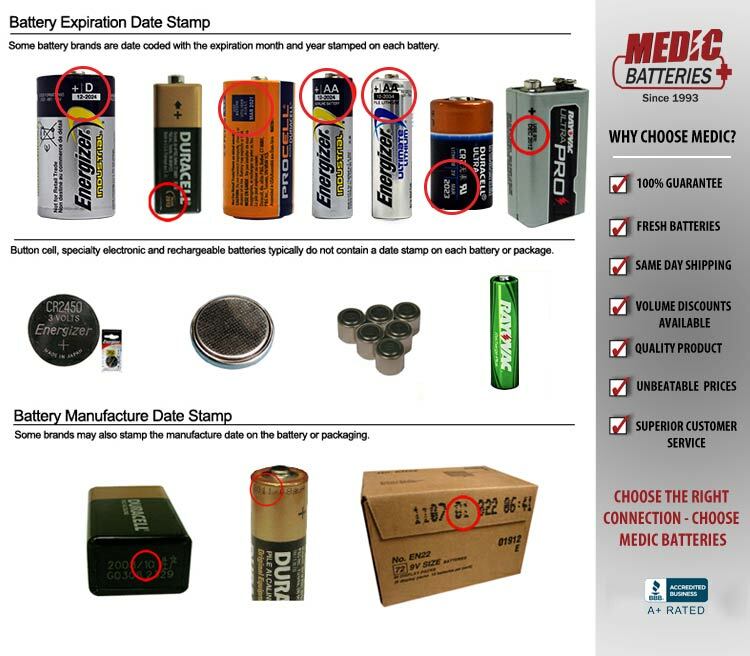 Order from Medic Battery to ensure your Duracell AA battery life is fresh as soon as you order your shipment. Button Cells – One important piece of information that's missing…there is no battery expiration date code. Nothing is written or printed on the packaging or on the battery.